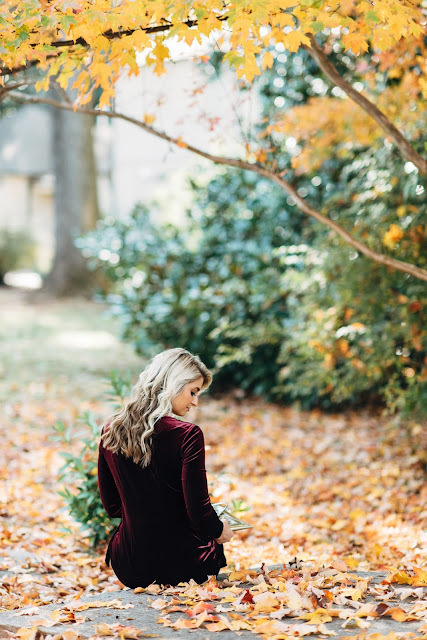 The first official day of winter is a little over a month away, and with temperatures rapidly dropping, I wanted to take some time to share a winter wedding look to get you through this festive season! Being that our wedding is also in the winter, I'm noticing that people truly do stress out about what to wear to weddings. So hopefully this post brings you some inspiration! 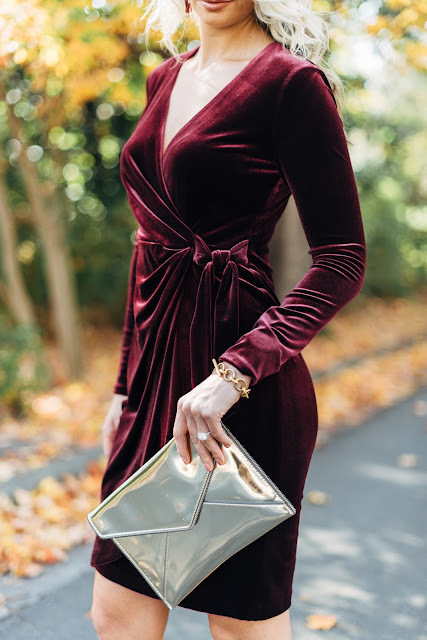 I found this velvet wrap dress on Maggy London's site and knew it would be perfect for a wedding we were attending towards the end of the year. I'm a fan of wrap dresses in general, but the added texture the velvet gives this dress just made me fall head over heels for it! 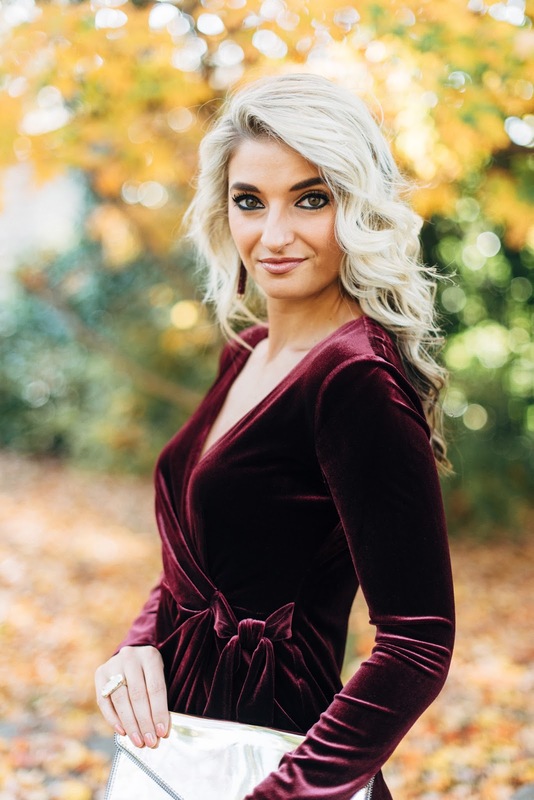 It's a gorgeous Bordeaux color (which screams fall/winter/holidays to me), and it's thick enough to keep you warm (great quality for the price point). This could also double as the perfect option for an office holiday party! I typically wear a size 4 and sized down one size to a 2 in this dress for the perfect fit! It has some stretch to it as well! 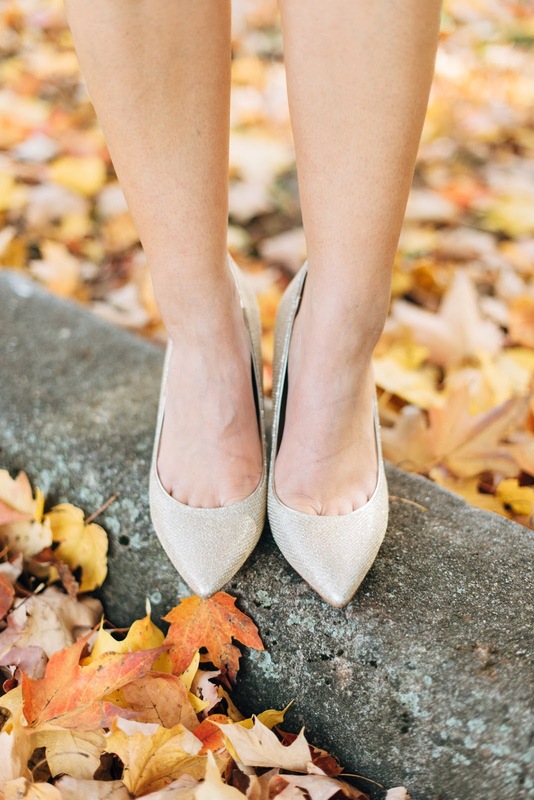 The wedding we were attending was in the evening, so I opted for gold accessories to glam things up a bit but you could easily pair it with neutrals too. The stock on this dress is running out faster than I've ever seen anything run out before. I was able to find most sizes but at separate retailers. If you click on one of the links in the widget below and don't see your size, click on the next photo as I linked all the sizes I could find via different retailers. Petites however, are fully stocked! Side note, I feel like everyone around me is sick right now! Lord knows I can't afford to be sick again being 46 days away from the wedding! I'm already getting achy, so I'm running around the house taking every vitamin and preventative measure in sight! You look gorgeous in this outfit. Coyote fur hood will look great on you when you wear it on occasion. Tuxedos have been always in trend for the wedding day especially in winters. Time evolved and so has fashion but trend for tuxedo has not changed. I any day put on my custom made tuxedo for a perfect fit and dapper look.